On our first day in Tennessee after seeing the Sandhill Cranes we drove to see the waterfalls at Falls Creek Falls State Park. 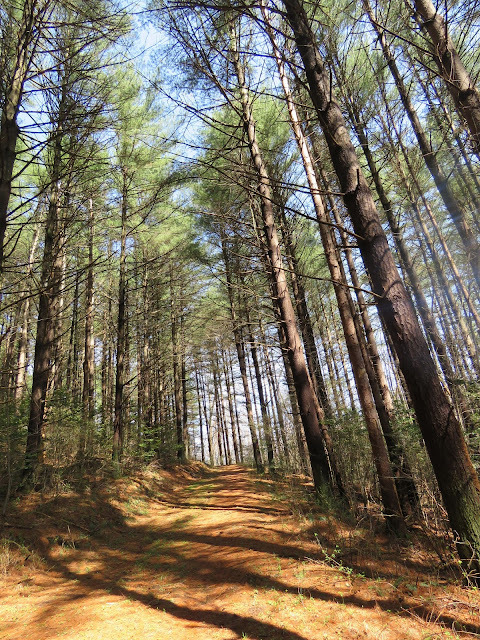 The park is 25,000 acres consisting of a lush forest, streams, waterfalls, cascades and scenic gorges. On this post I am sharing the Cades Creek Cascades and waterfalls. Our first stop in the park was at the Cades Creek Falls and the Cascades. The Cades Creek waterfalls. and another rainbow. It was a windy day at the park so outside the birds were hunkered down and hidden. I did hear a few Titmouse, Chickadees and Kinglets around the visitor center. We walked over several of these suspensions bridges. This bridge was at the Cades Cascades. I loved this view of the Cades Creek cascades, there is a small rainbow too. This park has several waterfalls and we tried to visit each one if only for a small amount of time. Along the drive at the park, we stopped for a quickie look at the view above. I like the trees. On another post I will share the Falls Creek waterfalls and views of the gorges. I hope you enjoyed my post. As always, I appreciate the visits and your nice comments. Have a happy new week ahead! This is such a beautiful area. 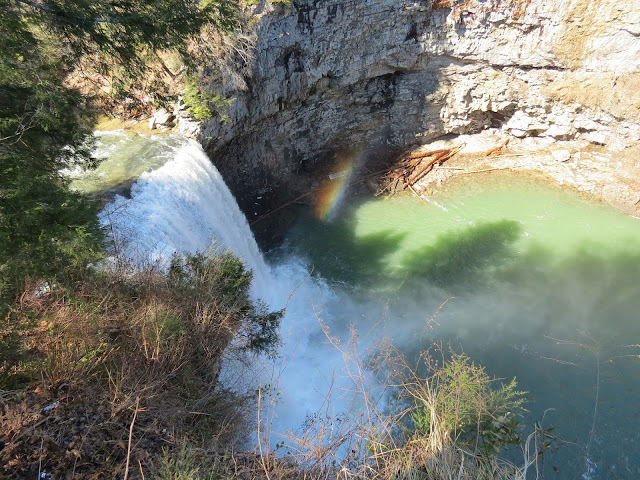 The waterfall with the rainbow is stunning. 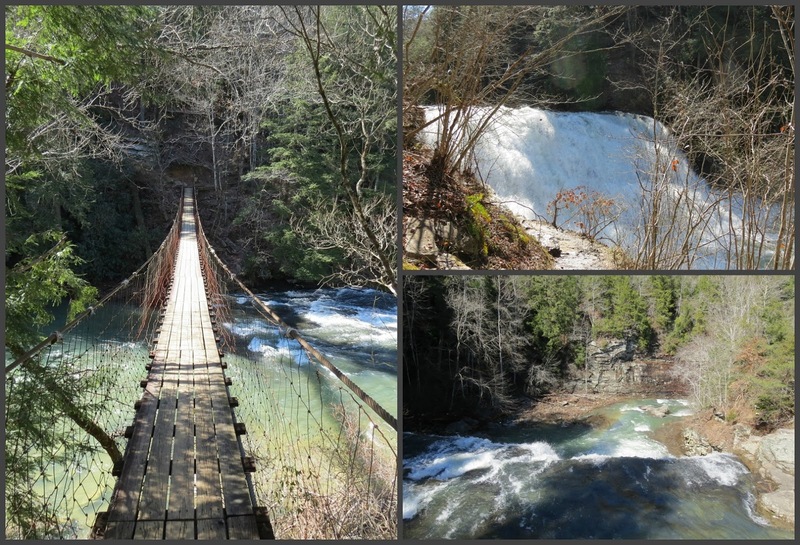 Bill would not (did not) like the suspension bridges, but I thought they wre wonderful. The last view of the point is wonderful. I miss I didn't get to listen to the river with you. Hello Eileen, what a wonderful place you have visited! The views are breathtaking. The waterfalls and cascades are very beautiful, but the last photo is my favourite. Thank you for sharing and have a great week ahead! Tennessee is such a beautiful State. I have always wondered how Sandhill Cranes have to ability to live in such different climates. We had them in Idaho as well. I suppose they migrate. You know Eileen, we would enjoy having you share this special post with us at Thoughts Of Home On Thursday, if you have the chance. Hi Eileen--nice place. I don't think I could do those suspension bridges!! Scary! We have a Falls Creek, here in Victoria, Australia, It's one of our lovely skiing areas - such a pretty name, don't you think. The Falls Creek you visited is beautiful, I love the suspension bridges, such a clever "at one with nature' way of getting around, if you don't mind the wobbles! What a beautiful location to celebrate nature. 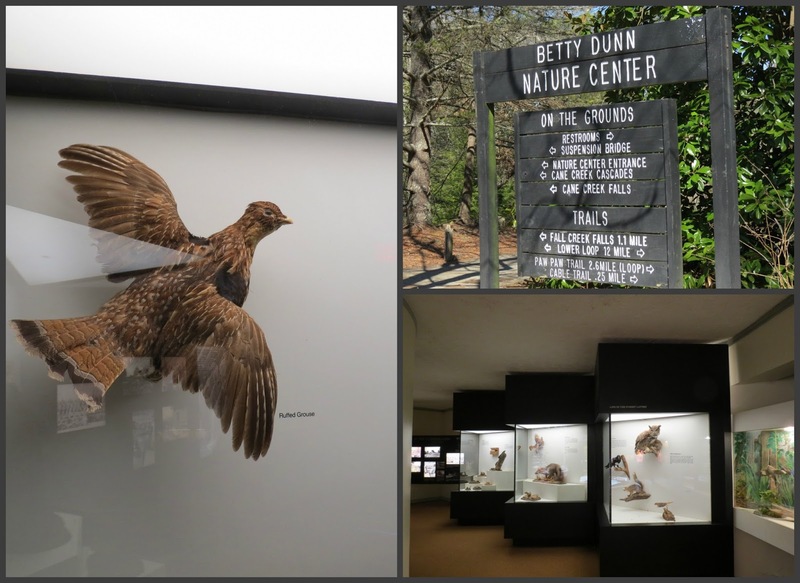 An incredible place for gorgeous scenery, walking and seeing wildlife. Great photos Eileen! You are so blessed to see such amazing places. Thank you for allowing us to see through your lens. Beautiful pictures of a wonderful landscape. I love the waerfalls and the trees at the top of the mountain. The falls are very beautiful! Lovely photos . Looks like a fun place to go ! Thanks for sharing , have a good day ! You caught a rainbow! Beautiful. I do love that last pic, but I must say the other shots are so appealing. I wish I was there looking at them. Hi Eileen, thanks for stopping by my blog. I love those trees too beautiful waterfalls. How was the walk across the bridge nots sure if Icould walk across it..
What beautiful scenery! I love waterfalls and those rainbows are really pretty. I don't think I could walk over that suspension bridge though! 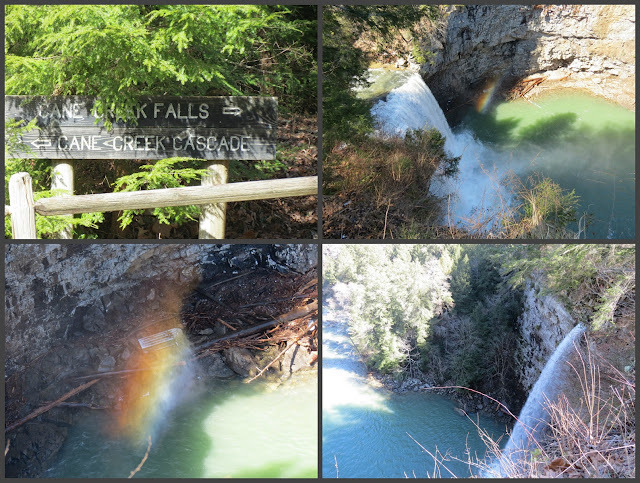 Love that many of the waterfalls have rainbows! You seem to find a lot of those suspension bridges. ;) I might have to crawl across. Wow great waterfalls and views. You are getting to see a lot of places. wow, gorgeous photos of this wonderful area with the water cascades, the bridge, the trees and this adorable view in your last photo. I enjoy going along with you on your travels, Eileen, I don't make it to nature preserves very often. The water is such pretty colors, and the rainbow is so pretty. What a gorgeous place for a hike. So beautiful landscapes and waterfalls! Great photos too! Now when I read "The park is 25,000 acres consisting of a lush forest, streams, waterfalls, cascades and scenic gorges." I thought that it sounded a wonderful place. Seeing all your photo's confirmed it. Wonderful scenes the waterfalls, the rainbow, the walk-way bridges - everyone of them were lovely to look at. I enjoyed my visit, thank you. All good wishes for the new week ahead. What a beautiful park...the falls are amazing but oh that last photo of yours just took my breath away! A beautiful place for walking with gorgeous vistas. Makes you wonder how those trees can be growing in rock. love the view from the bridge but would not cross it is you held a gun on me.. i used to walk home from the school and go 1/2 mile around to keep from walking the swinging bridge. i love the tree on the ledge and all that gorgeous rushing water and water falls. So beautiful to exciting place, you have a lot of great wild nature as well. Great pictures, good new week for you. Wow.....beautiful scenery! I like the last image very much. Gorgeous views and mini rainbows! A wonder place with magical aspects, from elements of nature, waterfalls, rainbows, stones, rocks, trees, of course critters,... What beautiful park to have a walk! Many thanks for sharing, all of these, with us! Best regards in the new week! Beautiful cascades and waterfalls, Eileen!! Tennessee has some amazing parks and countryside. You're a braver woman than I to walk across that suspended bridge. Our family walked across one of those at Grandfather Mountain, NC, when I was growing up and Never Again. ;) I have a wee fear of heights. Thanks so much for your visit and comments -- have a great week!! i have been writing down all the wonderful places you visit, in the hopes of following in your footsteps. you find the most amazing, natural, nature centers!!! of course, i loved the water and waterfalls best but all of your images are beautiful!!!! ooooooo and i forgot about that last one, WoW!!!! amazing!!!!! Beautiful shots of a beautiful area. I think I see signs of spring peeking out--if this is a recent picture. With the warmth here now it's popping out all over quickly. Have a nice week Eileen. Your photos are always lovely, Eileen. My favorite is the waterfall. I love waterfalls, and that place looks wonderful. I bet it sounded spectacular. Great shots. Beautiful pics, always love to see new places. I like those trees on the jut out. I'm going to start participating in your Saturday's Critters. Love the suspension bridge and would love to walk over it!! Amazing how the trees grow on ledge of rock like that. Great photo. Fantastic views of the Falls Eileen. I wonder does the suspension bridge sway a lot? That would be a fun crossing! I love the trees on the edge of the plateau! Hi Eileen, One of my favorite TN parks. I lived about 50 miles from there in Fairfield Glade (Crossville area). Not strong for the birds other than vultures but gee, gorgeous scenery in at gorge and waterfalls area! Glad you had a nice visit. Have a super good coming week! I think I saw some of these on facebook, right? Tennessee, as you know, is one of my favorite places! It has been years since I have been this area but I do remember it. I would love to walk across that bridge! Your photos are awesome! Stunning images, what a wonderful place to visit. the last image - I am speechless! the whole trip is amazing - my kind of past time. What a beautiful water fall. As always you take such beautiful photos of places I'd like to visit! Thank you! Wishing you well! What a beautiful place this is. I particularly like the last shot. 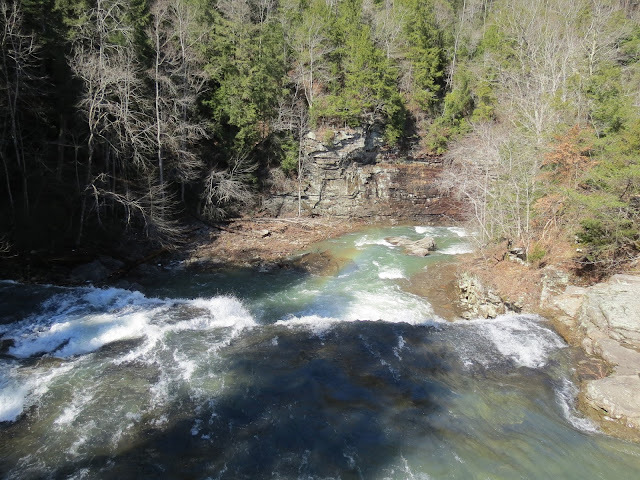 I often see these waterfalls on Betsy's blog, Reflections, as she lives in Cades Cove area, but it was nice to see your perspective of them, Eileen. The trees on the ledge look like bonsai--so pretty! Very nice ! I like the rainbow ! My wonderful Eileen, you always amaze me, indeed, amaze me more and more with your stunning photographs, and I'm so very grateful to you for this, I enjoy your posts so very much ! Beautiful water shots..I can't get too many falls scenes...Looks like a lovely area..Thanks for sharing..Enjoy your week...Do you think we will see the sun?? Oh my goodness this is a particularly spectacular park. Love the hanging bridge, the waterfalls and the trees in cliff. Awesome. Wonderful place.. Nice series of images.. Cheers..
A beautiful place Eileen, love the way you captured the rainbows and those trees look like bonsai. Waterfalls - am addicted to them, and brings us back yearly to Yosemite Nat. Park! Hope you read this before We.! Please add me to your list of links - started a meme called SEASONS, and anything during the season goes (so beyond landscapes). Thumbnail link is open Mon-Wed. 7pm Pacific time. Hope to see you there! Very creative photography and presentation ~ even more so for this post ~ Beautiful! I would have been a nervous wreck crossing that bridge. Beautiful images! Nature escapades like these i always love, better than the birds, sorry about that Eileen, hehe. Waterfalls most of all are my favorites, but here most are difficult to reach so i have not been going for more falls, but i've been to more accessible ones. And i am so impressed with the plenty of comments you are getting, i hope i get at least half of those, 59 before me, LOL. Yes the fall images are indeed mesmerizing! I like the rainbow shooting out of it. Wonderful collages made. Nice of you to take us all on this great tour of the falls and mountains in Tennessee, Eileen. I loved the refraction of light in the photos - almost like a rainbow. How beautiful is the waterfall and rainbow. What an amazing place to visit. Our earth is full of so many beautiful places. The trees on the edge of the cliff are starkly beautiful, even as they are covered in spring green. They must be tough little trees! beautiful nature :-) - happy week !!! Nature is really beautiful and you capture it very well! Wow great landscape you have caught here. Beautiful. I do like that tree in the last image - its looks old, but with that kind of location, who can tell. Who knew there could be such beauty and not that far from where I live. I love the trees in the last view too, Eileen. They have a very oriental look. This is a beautiful park ... I look forward to more pictures from this trip. The waterfall with the rainbow is beautiful. Boa tarde, lindo passeio a desfrutar de tanta beleza natural,passeios assim ficam para sempre na memoria. Gorgeous pictures from this beauty!Love the waterfall and the rainboy! Amazing images! !Thank you for sharing! And the foot bridge...that is awesome too. What a beautiful park. I'd love those suspension bridges! Precious waterfalls, and everywhere else, thanks Eileen. Some lovely scenery there, Eileen. I particularly like the last photo. How beautiful! Love the waterfalls and rainbows! Spectacular! What a gorgeous area, Eileen! Beautiful series. 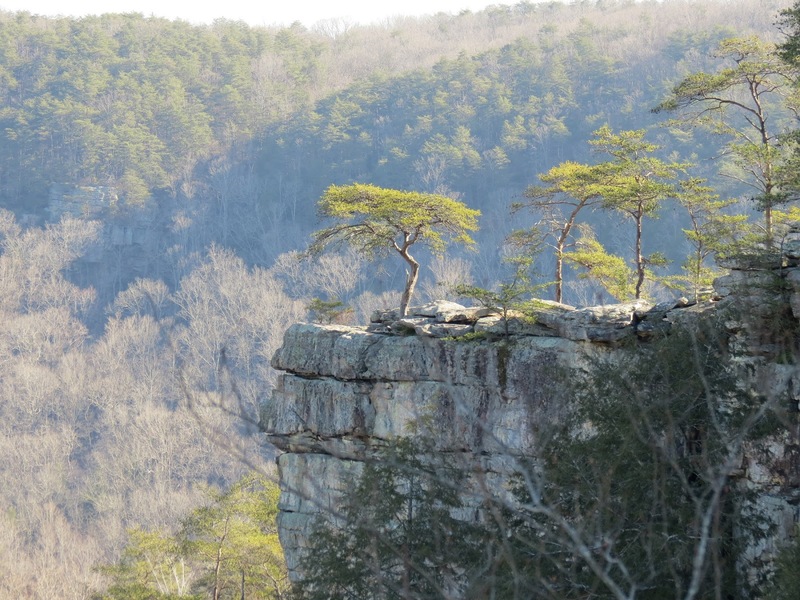 I love the image of the tree standing on the craggy cliff. Have a great rest of your week. hi Eileen, those rainbows are so beautiful! and the last image is gorgeous! have a beautiful day! Very beautiful post and pics, great place to enjoy nature. The last one, also my favorite, reminds me of the Blue Mountains in Australia! What a place. The waterfall is amazing. Wow another fabulous spot....and oh those falls are gorgeous especially the rainbows they make! I'm shooting pictures of parts of water rainbows today!!!! Stunning scenery, Eileen - and your photography with the rainbow spectrums is superb. Do you know if our Goldcrest (or Firecrest) is the same as your Kinglet? The falls I feel great to see. The water falls are gorgeous! Love that walking bridge. Wow! What a beautiful place... Going to look up where it is, mark it for future reference! Thanks for sharing! Hugs! We're happy that we stumbled over your blog as we are also dog lovers and we think to travel to the US next year and visit some parks. thanks you for these gorgeous pictures. We will think of this one.